Great as spread or sauce for veggies. Heat olive oil, add the garlic and mushroom, saute over low heat. Put mushroom mixture into food processor with olive and blend. 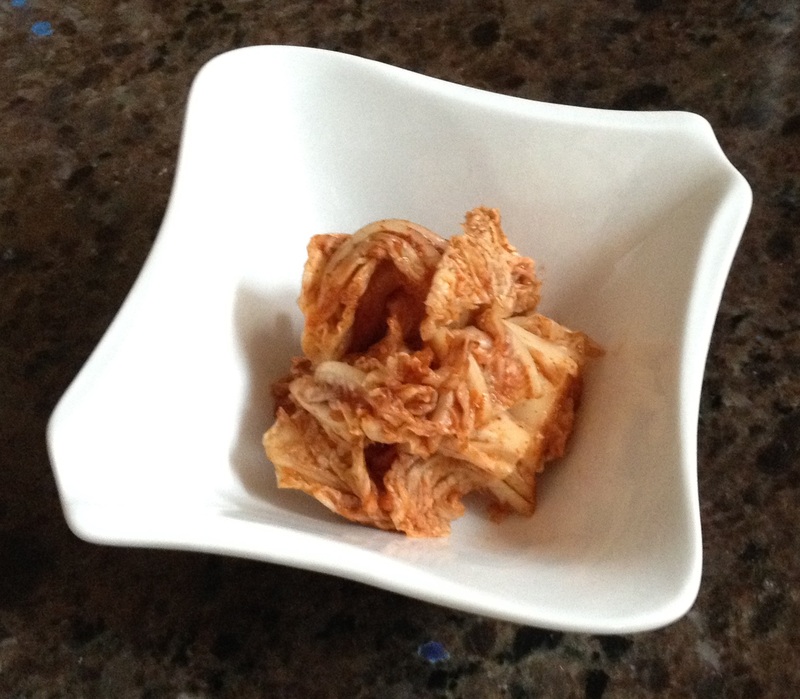 1 cup soaked wood ear mushroom, cut into thin strips. Add potato, sauté 2-3 minutes. Add wood ear, sauté 2-3 minutes. Add soy sauce, balsamic vinegar, and sugar. Sauté and mix. 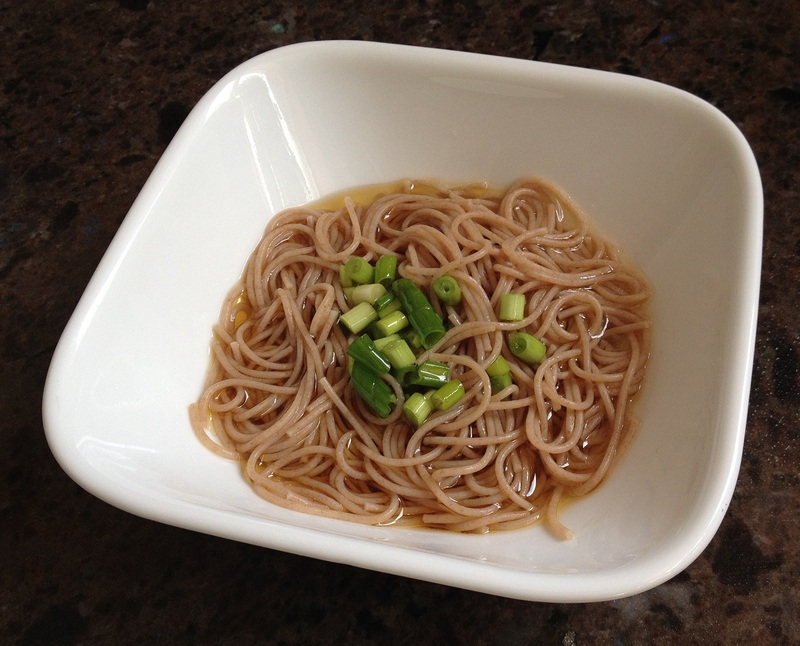 Turn off heat, add sesame oil and scallions, stir to mix. Serve with rice or tortilla. Trim ends of enoki mushroom and separate the stems. Mix garlic, thyme, soy sauce, balsamic vinegar, honey and water. Bring to boil, add mushroom. 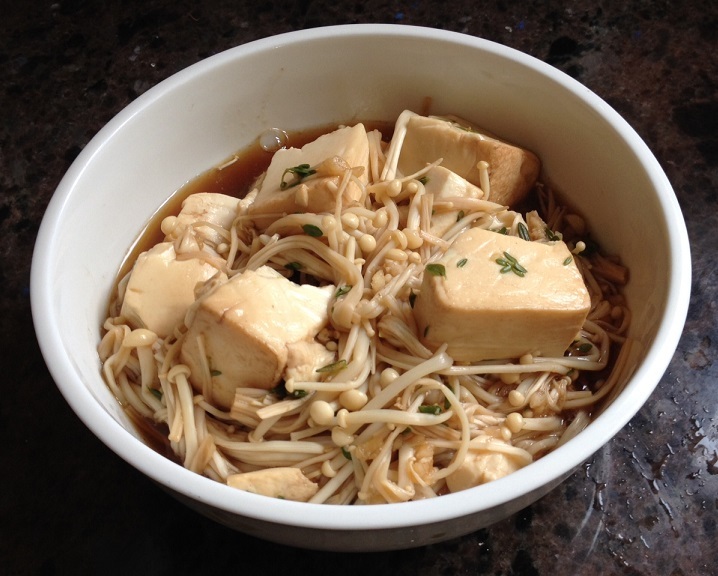 Cook until soft, then add tofu. Simmer for 3 minutes, adding more water if too dry and adjust seasoning. 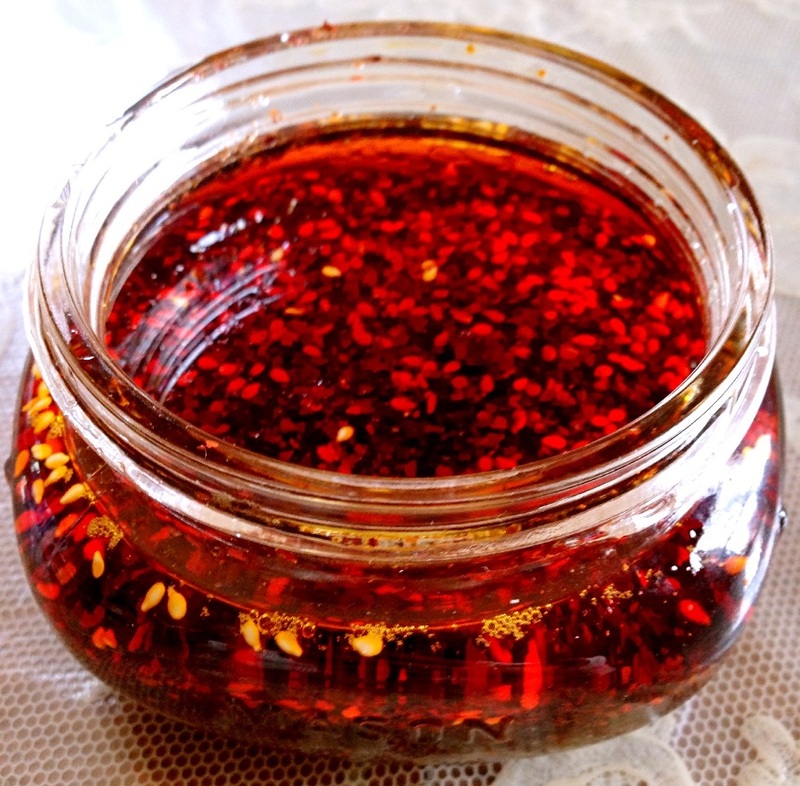 Need some Sichuan hot chili oil? You can make it at home, and it’s not complicated at all. I learned this from a native Sichuan chef. Easy and authentic! Put 2 tablespoon red chili flakes and 1 tablespoon sesame seeds into a ceramic or ceramic container, mix thoroughly. Heat oil in pan, when the oil gets a little smoky, turn off the heat immediately. Pour hot oil onto chili flakes and sesame seeds, stirring while pouring. Divide remaining red chili flakes into 3 portions, each containing 1 teaspoon. Let the oil cool a little, then add 1 teaspoon chili flakes, stir to combine. Let the oil cool a little more, then add 1 more teaspoon chili flakes and stir to combine. When the chili oil has cooled down to room temperature, add the remaining 1 teaspoon chili flakes and mix well. Note: Do NOT use chili powder, fine chili powder becomes bitter when mixed with hot oil. 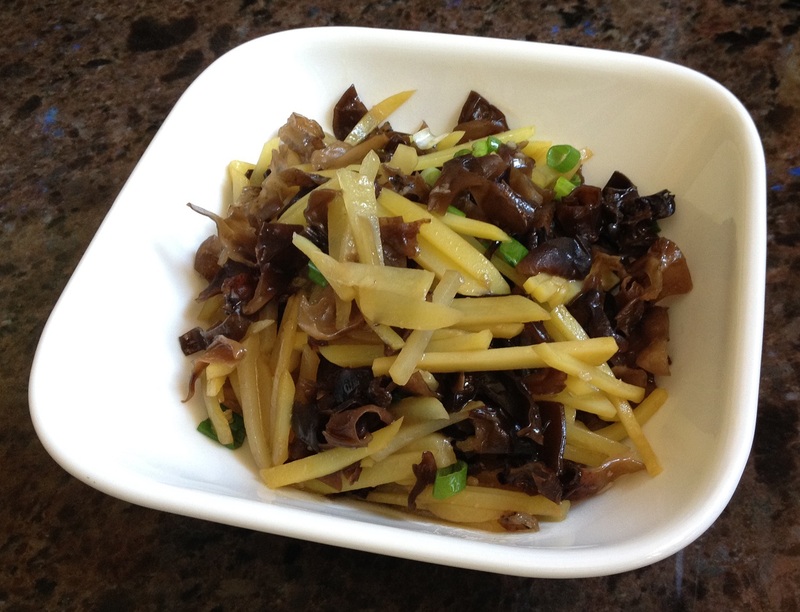 Simple recipe for a hungry moment, based on traditional Taiwanese dish. 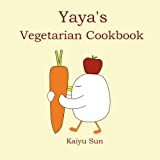 Mix vegetable broth sesame oil, rice wine or sake, and salt to taste. Boil a pot of water and cook the rice noodle according to instruction. Drain noodle to a bowl and pour over the sauce. Use paprika instead of chili powder. It looks red but it’s not spicy. Also I eliminated all seafood and fish sauce that they sometimes use to make kimchi, sot this is vegan. Quick and easy. Rub cabbage with salt, let stand 2 hours. Mix the rest of the ingredients, and add to cabbage. Pack into a jar and refrigerate 24-48 hours.